If you have recently enclosed your covered porch, or if you have purchased a home with an empty sunroom, what is the next step you should take? Like any room in your house, the enclosed porch, sunroom or Florida room deserves some decorative attention! Here are a few tips for turning that plain porch into an inviting sitting area that is sure to impress guests. If your porch has an abundance of windows, you might choose to apply blinds for those days when the sun shines a little too bright! Simple rattan roll-up blinds offer a summer look and can be easily raised and lowered. Fabrics for curtains, although colorful, will fade over time from the constant exposure to the sunlight. And since curtains can sometimes be costly, a more affordable option to cover floor-to-ceiling windows is a shower curtain! They are very easy to install and come in all kinds of colors and designs. If your sunroom offers access to the backyard, the best options for flooring might be concrete, slate or vinyl tile. Indoor/outdoor carpeting is also a comfortable option. You can always soften the look of the hard floor with hemp accent rugs that add flair, yet remain semi-resistant to dirt and moisture. Depending on the size of your porch, if you plan on entertaining guests in this space, adding a table, some chairs and couch is ideal. Lots of patio furniture is made of wood or wicker, to be able to withstand outdoors. However, if you have installed electricity and a heating/cooling system, feel free to add any type of furniture you like! You might even want to consider purchasing a porch swing! It’s a nice alternative to a recliner, usually found in a living room or family room; and most are sold at hardware stores and department stores with the intention of customers placing them in outdoorsy areas. After adding some patio furniture to your porch, dress it up with comfy cushions and colorful pillows! If your porch is more of a sunroom than an extension of your home, you may want to consider pillow fabrics such as woven polyester or laminated cotton. These can easily be purchased at fabric stores or stores that sell camping equipment. Who says you can’t enjoy the outdoors at night? Built-in lighting, table lamps, lighted fans and floor lamps make all the difference. Unless you have extended your home’s electrical power into the porch/sunroom, it is best to avoid conventional lighting. However, if the porch is equipped with electricity, add strings of Christmas lights. They twinkle like stars in the night sky! Yet, since the space is drenched in sunlight during the day, you could even consider a green option and use solar-powered lights! Don’t over do it; provide yourself with enough light to see where you are going. This way, you will spend less money, be kind to your neighbors, and you will feel as though the soft moonlight is illuminating your porch. 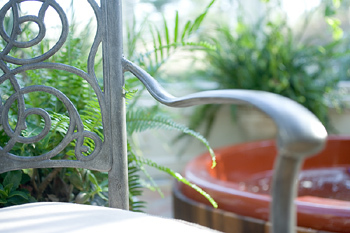 A sunroom offers you the opportunity to spruce up your new space with verdant plants! Potted plants can be placed on window sills or small tables. Install a small hook into the ceiling and add hanging plants for even more flair! By using natural decorations to put some life into your porch, you can create an instant connection from your enclosed space to the rest of the landscaping in the backyard! Feel the warmth of mother nature all year round.